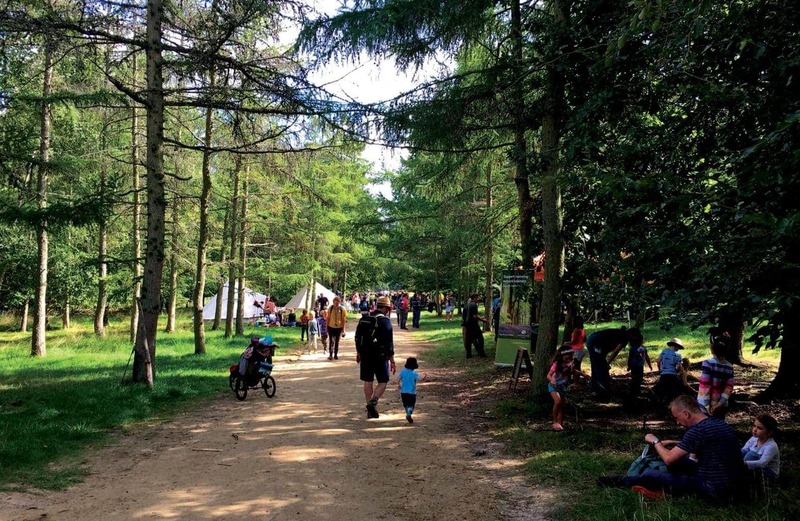 With the prospect of a record-breaking second sunny May bank holiday, we decided to pack up Donald Trump (our motorhome) and head down to Conkers Camping and Caravanning Club site in the heart of the New Forest in Derbyshire for the weekend. 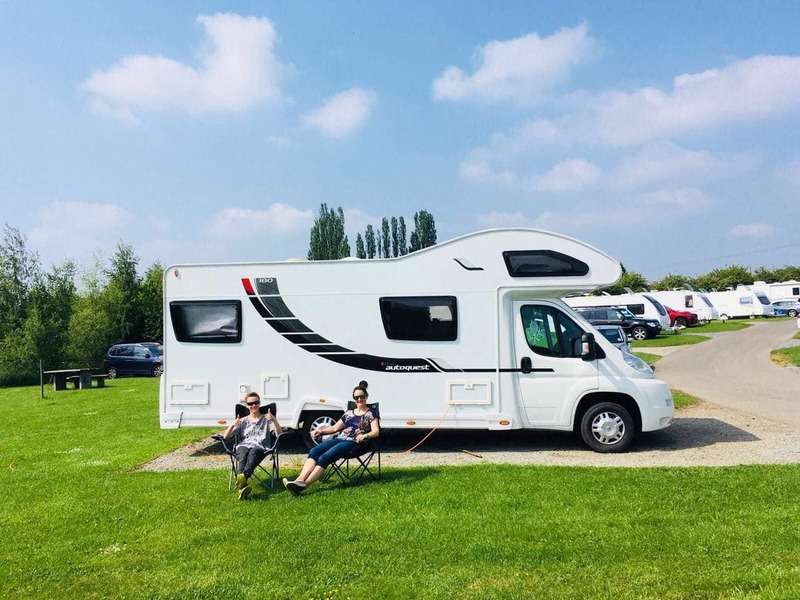 Located a few miles from the spa town of Ashby-de-la-Zouch, Conkers Camping and Caravanning Club Site has about 90 pitches for tents and motorhomes as well as 5 glamping tents. 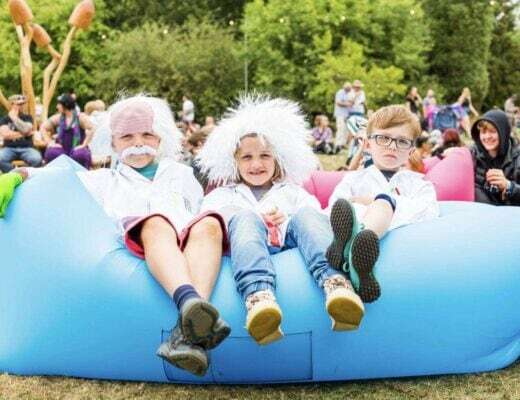 The pitches are all pretty flat and spacious and the site is really well kept, with large grassy areas between pitches, a big grassy play area for kids and a small adventure playground. The site was great for cycling around as the paths were flat and even and you can pretty much see your children wherever they are. The toilet and shower facilities were spotless whatever time of day we went in. The site was really quiet at night, with no traffic noise (although we were treated to a very loud storm with thunder and lightning just before we went to bed, which was pretty exciting!). There’s a small shop on site selling all the usual necessities and you can get camping gas. There are also laundry washing and drying machines for a small charge. Just next to the entrance to Conkers Camping and Caravanning Club Site is the National Forest YHA, which has a cafe. Otherwise there aren’t any pubs or restaurants within walking distance. We headed out of Conkers Camping and Caravanning Club Site and straight onto one of the 22 New Forest walking trails, which are well signposted and of varying lengths. For the more energetic, the 75 mile National Forest Way is accessible a short walk from the site. We wished we’d brought our bikes as we’d have been able to do a lot more exploring, as these tracks were all pretty flat. 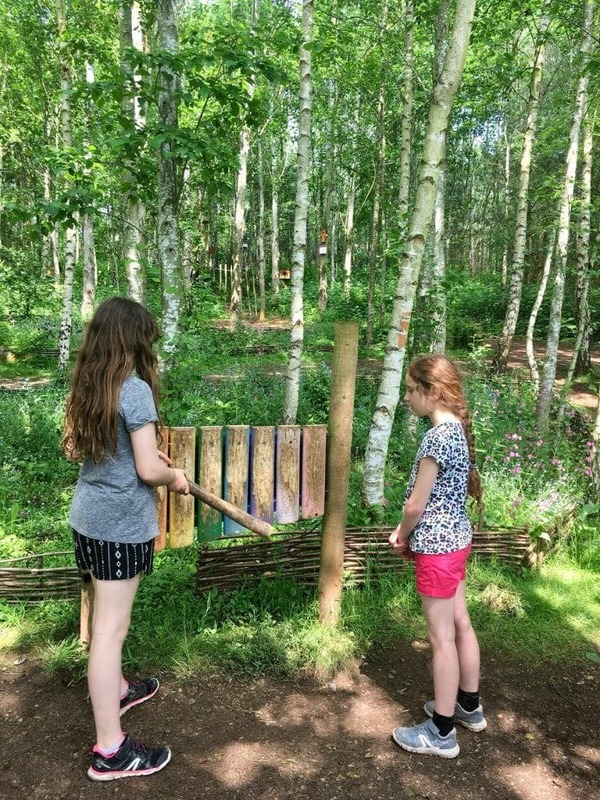 We walked for about ten minutes through some really beautiful woods and meadows, covered with wild flowers, until we arrived at the award winning family attraction, Conkers. Conkers is set in 120 acres of woodland and has various activities dotted around outside and a brilliant Discovery Centre inside (a bit like Museum of Science and Industry, with plenty of interactive activities for the kids related to the forest and wildlife, and a children’s soft play designed like the inside of a forest). 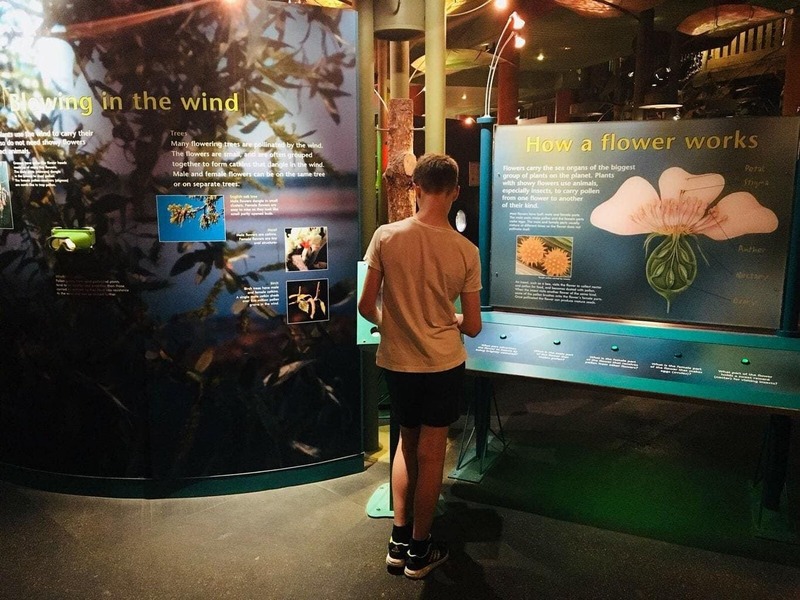 Also inside is a 4D cinema with regular free ten minute showings of a lovely little film about life in the forest from an insect’s point of view. The kids loved the 4D element, especially when we were sprayed with water and felt leaves swishing against our legs and wind in our faces. 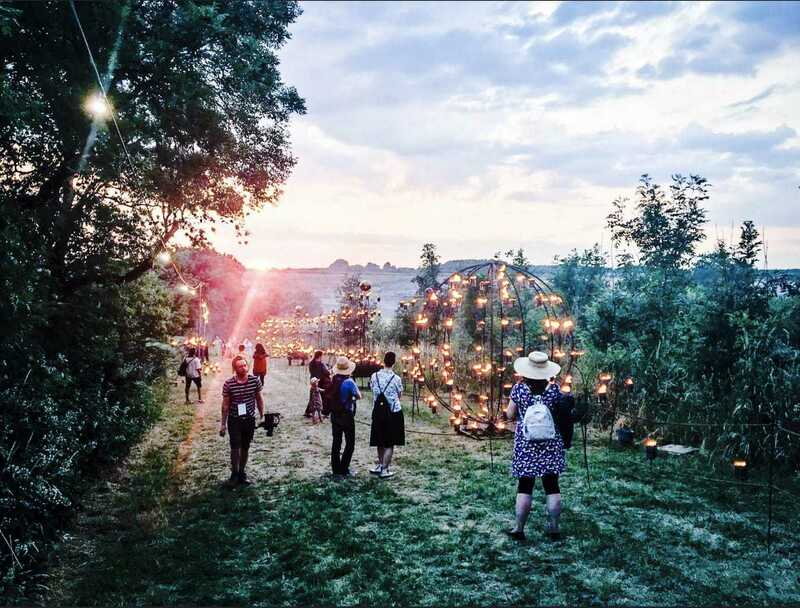 You could easily spend a whole day at Conkers, as the outside space is absolutely huge, with tons to do. We really enjoyed the Barefoot Trail through the forest, walking on bark, pebbles, logs, mud and through different pools of water – as well as being lots of fun, barefoot walking is apparently very good for our circulatory system too! 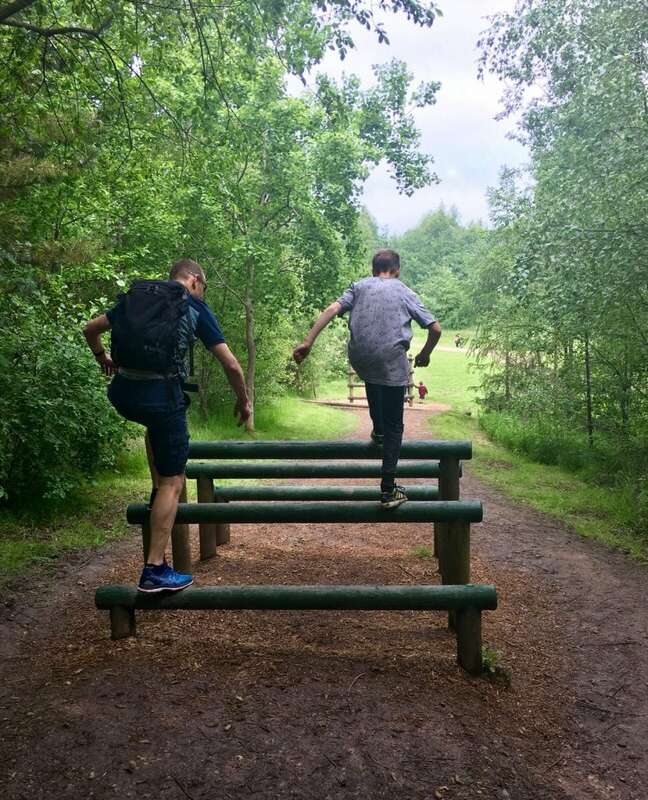 Another highlight was the Activity Trail, a pretty challenging obstacle course through parts of the forest. 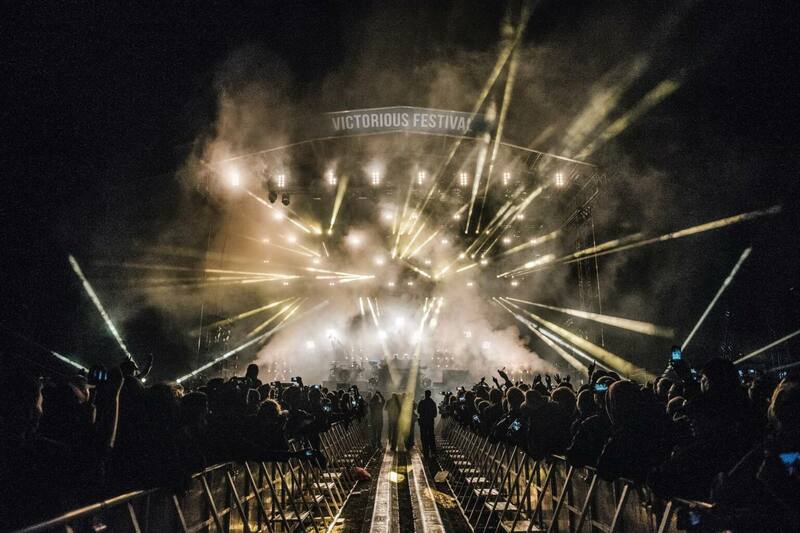 Although a sign said it was for ages 13 and over, people were largely ignoring this (us included, we couldn’t resist!) and our 7 year old managed most of the obstacles with ease (and much better and faster than me!! ), and our 10 and 11 year old flew over them. 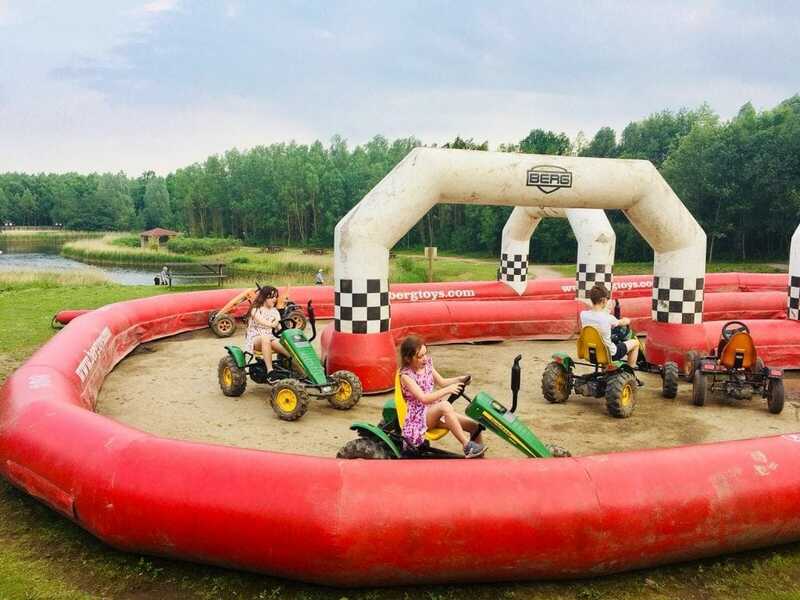 The kids all loved the go karting track with pedal go karts in an inflatable track, with a beautiful view of the lake in the background for Ed and I to enjoy. 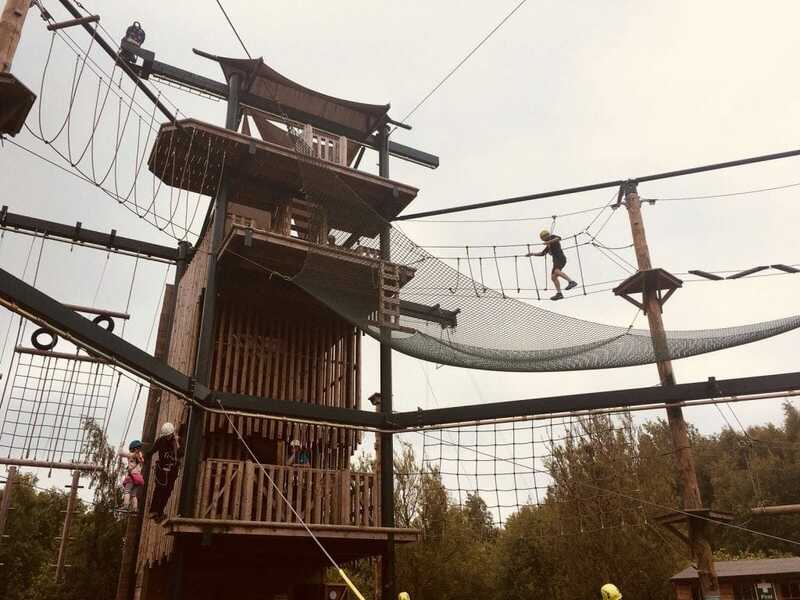 All the activities inside Conkers are included in the entrance fee, apart from the High/Low Ropes, the rope climbing wall and the giant zip wire. 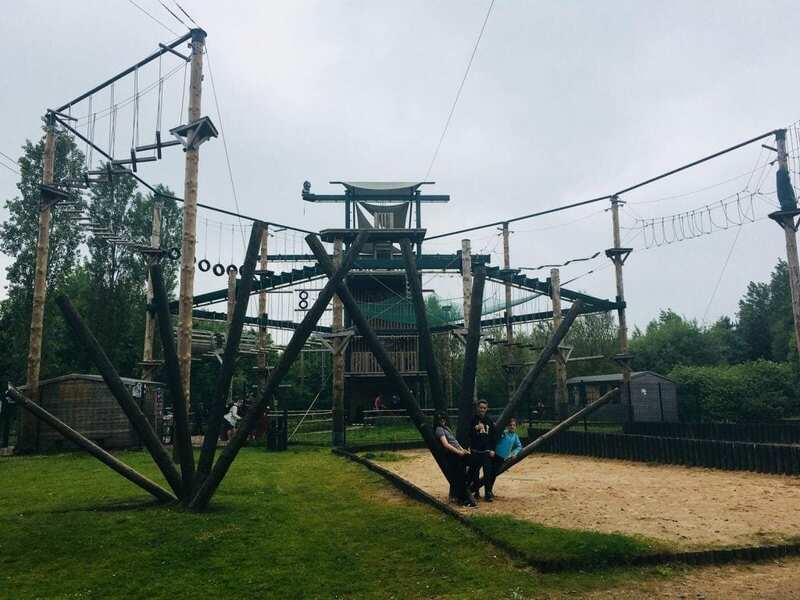 My two eldest children and Ed went on the High Ropes and a giant zip wire, while Rosie and I thought we’d take it easy on the ‘Low’ Ropes. The Low Ropes were still about 30 feet above ground and it wasn’t an easy option. 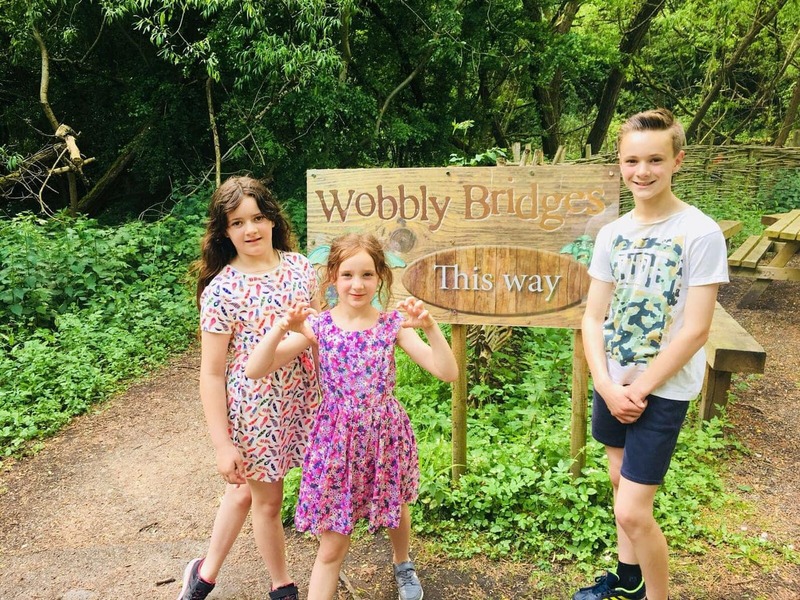 We really enjoyed it, but Rosie lost it a bit on one section where you had to cross a wobbly bridge without any ropes to hold on to, and I think I probably won the prize for slowest circuit. The others had a great time on the High Ropes, although Ed struggled a bit with a couple of sections. The instructor looked up at him at one point as he wobbled vigorously 50 feet above us, asked if he belonged to me, and then said ‘He’s having an absolute nightmare!”. Of course, this made my day. 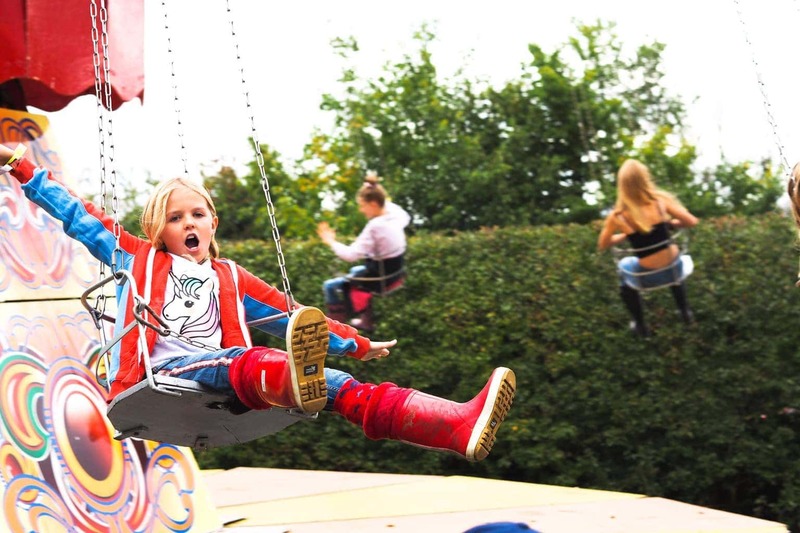 The zip wire was described as ‘sick’ and ‘epic’, which I think means it was great. Although there was an extra charge, this was pretty reasonable at £5 each for the Low Ropes and £7 for each of the High Ropes and zip wire. Bear in mind you need trainers or similar to do these activities – one guy in trekking sandals wasn’t allowed on when we were there, even though he’d booked and paid! 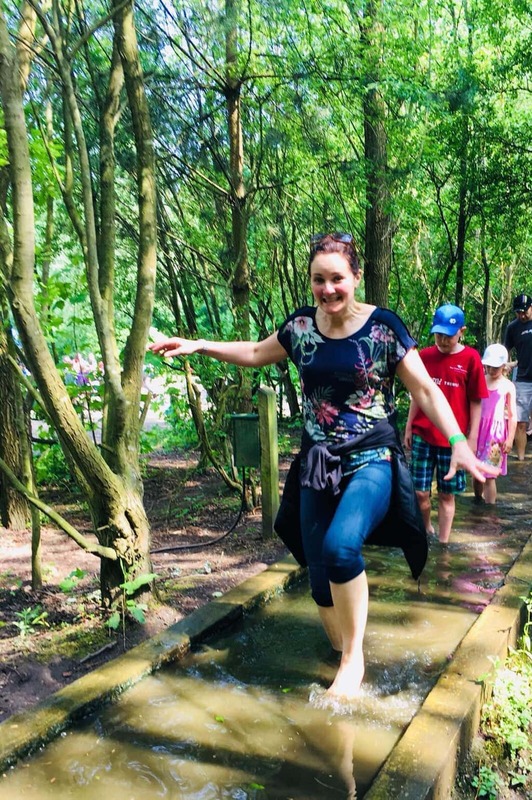 As well as these main areas, there are loads of other areas to explore – wobbly bridges set in the woodland, a treetop walk across platforms raised up above the forest and various trails through the forests. There’s a giant playground on one side of the park, and another smaller one near the High Ropes. 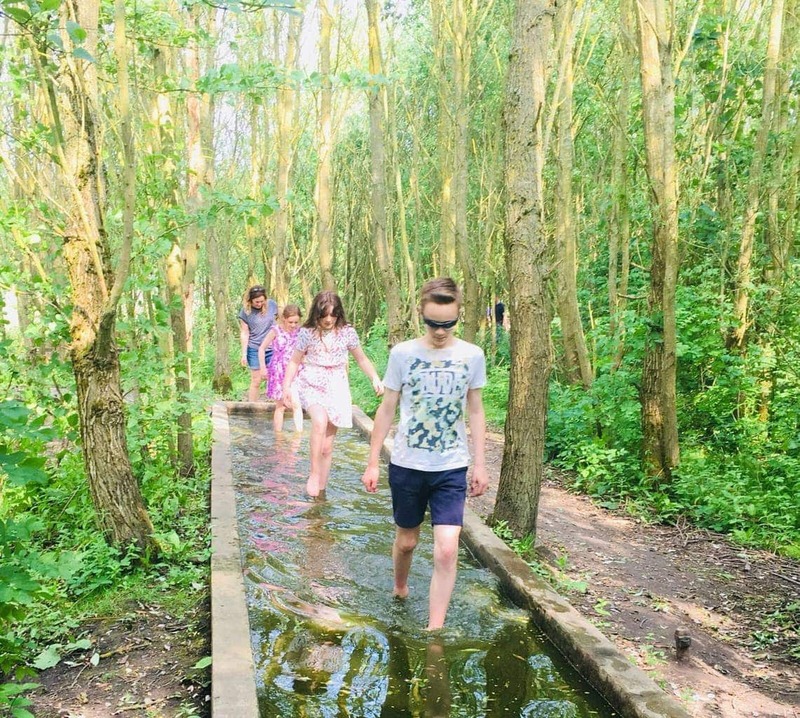 The free Conkerchoo train takes you through the forest from the Waterside Centre by one lake to the Discovery Centre by another lake, but it’s only a 5 minute walk between the two. 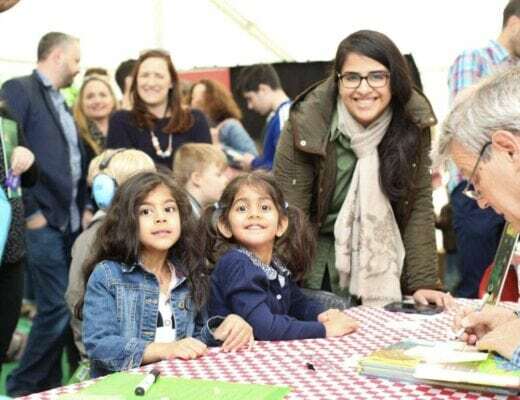 There are a couple of cafes on site, and we bought lunchboxes for the kids which went down well and weren’t too expensive, and our sarnies were nice. Entrance to the park is very reasonable considering you could easily be there from 10am to 6pm and not see it all, and we thought it was great value for money. 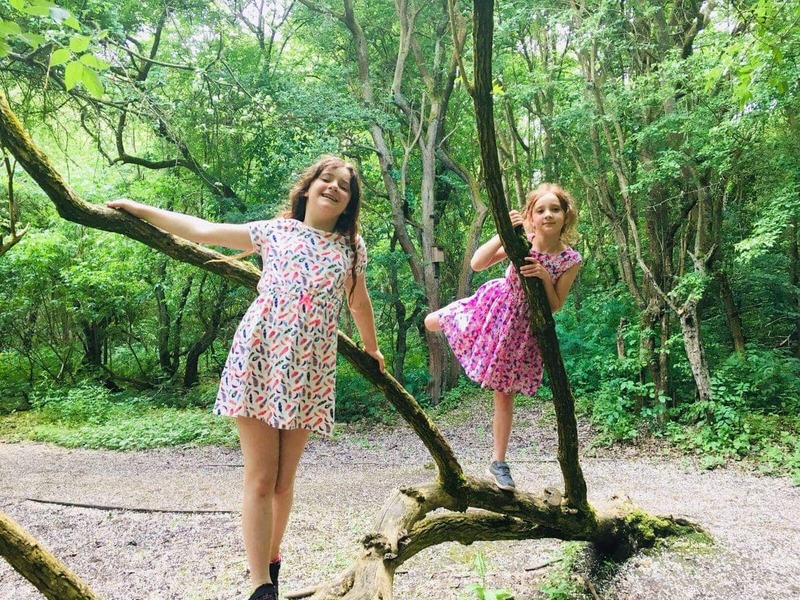 All in all, we absolutely loved Conkers Camping and Caravanning Club Site and also our day at the Conkers Discovery Centre, and we’ll definitely be back with our bikes to explore more of this lovely area. 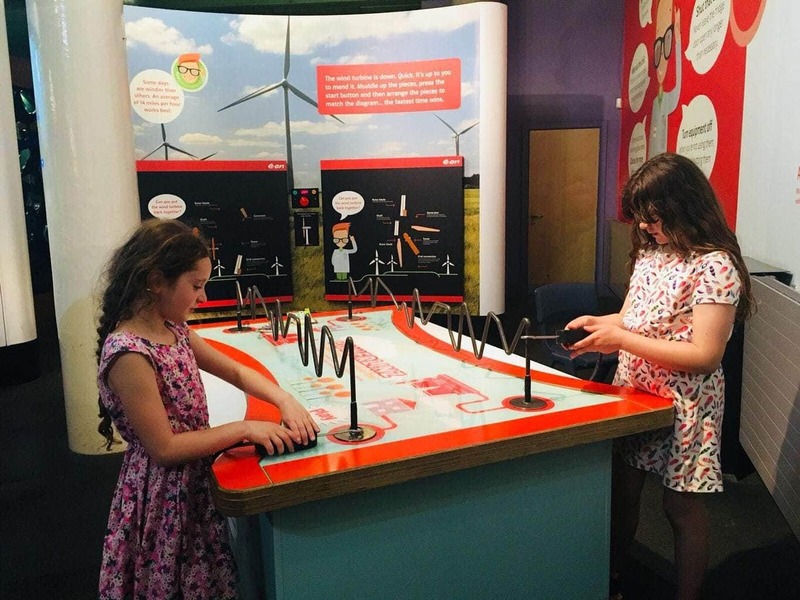 NB: Jane and her family were guests of Conkers Camping and Caravanning Club Site and also of Conkers Discovery Centre, but all views and opinions are her own. Family Camping is a wonderful experience. It’s one of the best a child can ever have!